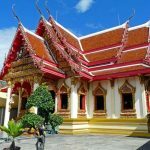 Thailand is home to some of the most beautiful and diverse natural sights, like the beaches and islands you'll find in the Kingdom’s sunny south. A quick Google image search of Thailand’s Andaman Sea will leave you breathless at the clarity of the crystal blue sea, the beautiful sandy beaches and the variety of wildlife that live in Thailand’s warm, clear waters. 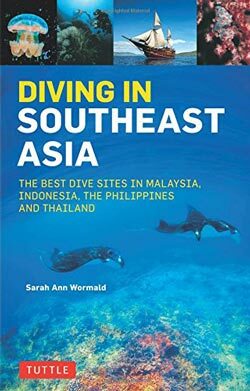 So it's no surprise that for dive enthusiasts, Thailand is considered one of the holy grails for underwater adventures. Moreover, it's a great place for beginners to learn and intermediate divers to advance. With this in mind, I’ve compiled the best of the best in terms of diving sites, times of year to dive, the cool creatures you’ll see, and importantly, risk assessment and safety. Here’s one factor that’ll have you beaming from cheek to cheek: Thailand’s diving season runs all year round, so there are no times that you should avoid the warm Thai waters, though there are certainly times of the year that will yield the most beautiful discoveries. Weather in Thailand is pretty invariably warm and humid, with the exception of the country’s northernmost cities. Temperatures in the South range from 30-35 degrees C (85-95 degrees F). You’ll get more humidity and rain if you’re visiting from May to September/October, which is the traditional rainy season, and you’ll notice that the country gets drier and less humid from November to March/April. The months of November through April are generally considered to be some of the best in terms of dive visibility, water temperature and in the amount of wildlife you’ll see. If you’re interested in the gentle giants that are whale sharks, you’ll want to visit anywhere from February to May. 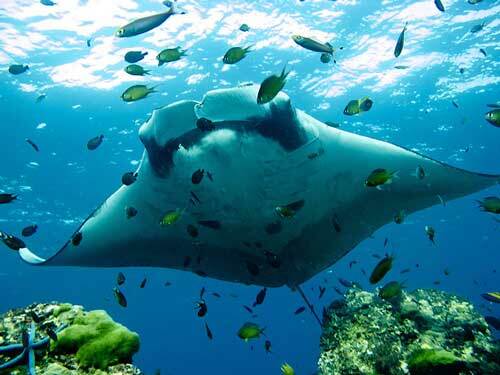 Experiencing the surreal grace of the manta rays that call the Andaman Sea ‘home’ can be experienced year round. November to April is also when many liveaboards (for the dive obsessed) make their pilgrimages to the Similan Islands, so if you’re interested in an immersive dive experience, consider going at this time. On the West Coast of Thailand, which is becoming more and more popular with tourists, the months from May to October can be considered the off season- it’s Thailand’s rainy period. Visibility and ocean calmness may suffer during this time, so if you’re planning a getaway for these months, consider relocating your diving plans to the Gulf of Thailand, which will still boast excellent sights during these months (considered its very own ‘high season’). For those who prefer warmer water temperatures, visiting from February to May is generally ideal, and for those who prefer cooler temps, visiting from June to October will be more preferable. It is important to note, though, that water temperatures rarely fluctuate more than 5 degrees- it could be about 31 degrees C in the warmer months and 26 degrees C in the cooler ones- all in all, the water will be pleasant and generally warm. Visibility in diving locations may vary, but there is a general consensus that 30 metres (or 100 feet) is standard in diving locations, which is excellent. Algal blooms may occasionally affect visibility, but will also bring in some pretty big creatures! 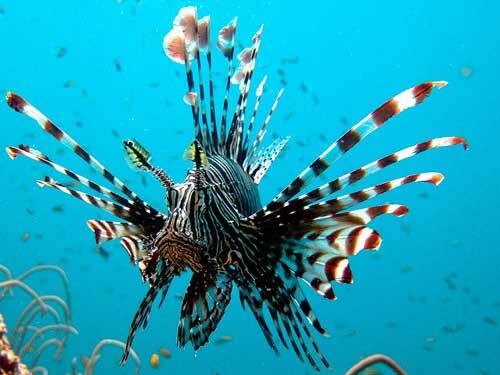 Wildlife in Thailand’s waters is varied and beautiful- you’ll see a variety of Indo-Pacific reef fish and other reef dwellers, as well as puffer fish, morays, trigger fish and Moorish idols. You may also see some bigger ocean creatures, like leopard sharks and even whale sharks, if you visit at the right time! The Andaman Sea is home to some of the most beautiful tropical fish, coral reefs and crystal waters. The islands in the Andaman sea are easily accessible from mainland Thailand, via flight or boat. Both Hin Daeng and Hin Mouang are located south of Phuket, but are easily accessible from the popular tourist location. They are both located within the confines of Thailand’s protected area Koh Lanta National Park. 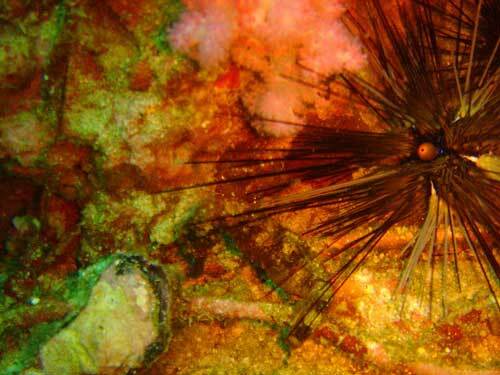 Both Hin Daeng and Hin Mouang are recognized as some of the best diving locations in Thailand. Diving at Hin Daeng will allow you to explore gorgeous soft corals while watching manta rays and even whale sharks. Hin Mouang is a deep dive location and is home to Thailand’s highest wall of soft corals that stretches to a depth of 60 metres. 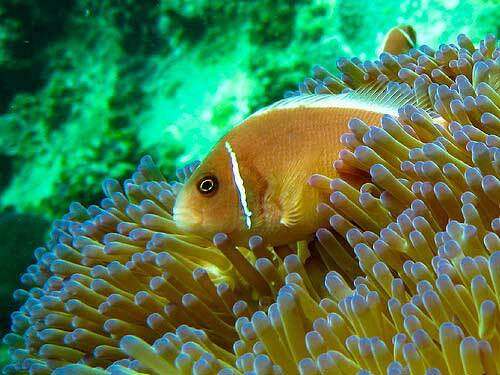 You can see many different types of anemones and sea fans as well as other colorful coral life. You can also spot reef sharks and leopard sharks. Located quite close to Phuket, Koh Dok Mai is one of the best wall dives in the Andaman Sea, and it stretches to 25 metres. You can see a wide variety of soft corals, many different types of fish and an abundance of eels and leopard sharks. Hin Bida is a great location for divers and snorkelers alike as it levels out at 18 metres, but provides beautiful reef views at just 3 metres. Here you can see gorgeous coral, snapper, cuttlefish, zebra sharks, box fish, puffer fish, and even whale sharks. A legendary holiday destination in Thailand made famous by “The Beach,” Koh Phi Phi has many fantastic dive locations. Bida Nok has a great wall dive, where you can see soft corals and sponges in every different color and shape, in addition to moray eels, wrasse, scorpionfish, leopard sharks, reef sharks and glassfish. The prime location in Thailand for whale shark sighting and diving. 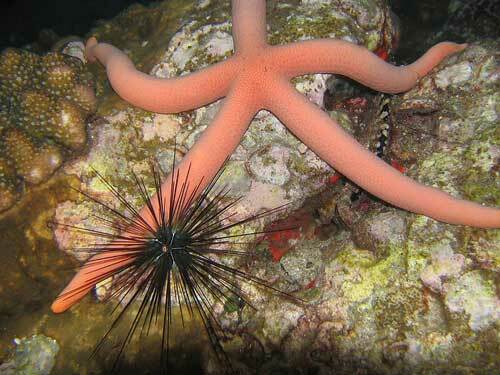 The rock itself, a huge granite pinnacle, is home to a variety of soft coral, sponges, sea fans and anemones. While waiting for whale sharks, you can also find groupers, rays and barracudas. Diving here is exclusively from October to May, though sighting whale sharks is more common in February, March and April. Koh Tao is one of the most popular dive sites in Thailand that offers amazing value for money. It is located off of Koh Samui and Koh Phangan and is easily accessible from each by boat. This is a relaxing dive site connected to Koh Tao by a small sandbar where you can see lots of reef fish in more shallow water. Koh Tao’s most famous (and most beautiful) diving location is definitely Chumphon. It is an enormous granite pinnacle that reaches to a depth of 35 metres. You can see beautiful anemones, western clownfish, grouper, batfish, barracuda and schools of jacks. You can also see whale sharks from February to April, as well as leopard sharks, lionfish, rabbitfish and bannerfish. For those who prefer shallow dives, Ao Leuk is a beautiful and calm diving location that maxes out at 14 metres. 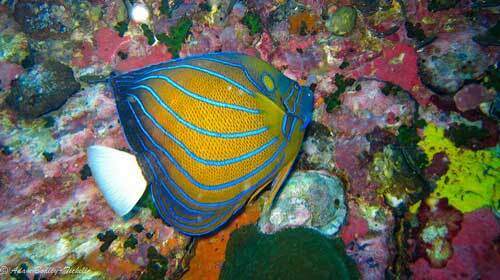 Here, you can see a variety of reef fish, like angelfish, butterflyfish, barracuda and also turtles. The Sattakut is the best shipwreck dive in Koh Tao. This is quite a deep dive, with the top of the ship leveling out at about 18 metres, but it is an excellent opportunity to spot wildlife like giant groupers, snappers, butterfly fish, sweetlips and others. Some say that the Similan Islands are the best for diving in Thailand. This area is part of a protected national park and is home to a variety of beautiful plants and animals. Accessing the Similan Islands is relatively easy from Khao Lak or Phuket. You can also access the islands for an extended trip with a liveaboard excursion. 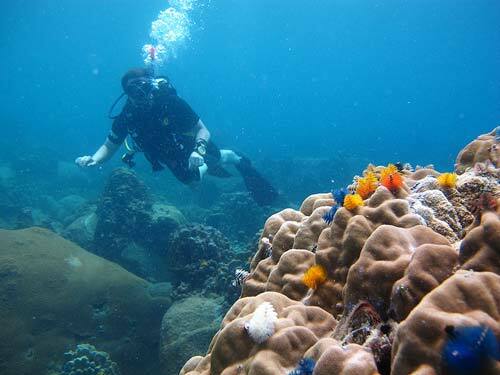 This island is one of the best for more shallow dives that feature incredible coral structures. Here, you can view acropora table corals, gorgonian sea fans, glassfish, goatfish, turtles, batfish and pipefish and cowries. Also called Hin Pusa, Elephant Head Rock has an amazing complex of large boulders, creating a maze of tunnels and caverns that divers can swim through. This is a deep dive location that reaches almost 50 metres. You can see whitetip reef sharks and leopard sharks, purple fire gobies, and dwarf wrasse. You can also find jawfish, cuttlefish and mantis shrimp. A great location for drift dives, Christmas point has an impressive drop-off where you can see reef sharks, Napoleon wrasses, barracudas, frogfish, ribbon eels and sea fans. Located about 25 km from Koh Bon, Koh Tachai is one of the most beautiful diving sites and has pristine beaches. You can access this island (part of the Similan Islands National Park) by boat from Koh Phra Thong, Baan Nam Khem Pier, Khao Lak or Phuket. Twin Peaks is one of the most beautiful diving sites in Thailand and it encompasses an underwater ridge allows divers to see coral, tropical fish, leopard sharks, nurse sharks, hawksbill turtles and manta rays. Southern Rock is excellent for deeper diving in stronger currents as the location boasts two boat moorings. It is a great location to spot fish! The Surin Islands are the best place to go in Thailand to see hard coral in all of its beautiful variety. You will also see schools of fish, like the Napoleon wrasse, yellow-masked angelfish, bumphead parrotfish, tomato anemonefish and barramundi. You can also spot turtles at this location! The Surin Islands are remote, so you will have to book a tour, generally from Khao Lak or Phuket. Hin Rap is a beautiful dive site in the Surin Islands, leveling out at 24 m. You can see pelagic fish here, as well as turtles. A more shallow dive site blanketed by hard corals. Known for its stronger currents, you can also see turtles, pelagic fish (barracuda and tuna), soldierfish, angelfish and reef sharks! Check out this island’s eastern coast, especially at low tide, when you can spot staghorn corals and porites corals. You’ll also see cardinalfish, humpnose big-eye bream and snappers. Depths here range from 10-25 m.
Located only a few hours from Bangkok, Pattaya is one of Thailand’s most accessible diving sites that boasts beautiful sights perfect for those interested in a short ocean stint! The islands can be easily accessed by Pattaya city. Koh Khrok is a gorgeous island about 8 km from Pattaya beach that is home to beautiful coral reefs (hard and soft) located primarily on the Western and Southern points of the island. Corals include Staghorn, brain, mushroom and table corals. You can also drift dive here and spot some Hawksbill turtles, pufferfish, parrotfish and wrasse. This is a great place for snorkeling due to the beauty in shallow waters. Located 10 km west of Pattaya beach, Koh Sak has gorgeous white sand beaches and extremely calm water. Most dive sites are maximum 15 metres and boast beautiful coral reefs where you can see pipe fish, dragon fish and sea horse. The largest of the three islands off of Pattaya, Koh Larn has many beautiful coral structures that stretch down as far as 25 metres. You can also spot nurse sharks in the area. Koh Chang is one of the biggest islands in Thailand’s famous Gulf. It has high peaks covered in lush jungle and gorgeous beaches. Getting to Koh Chang is relatively easy from Bangkok as you can take a 1 hour flight (or a longer bus) and then a ferry. HTMS Chang is Thailand’s longest shipwreck and is accessible to all divers. It boasts plenty of fish, including barracuda. 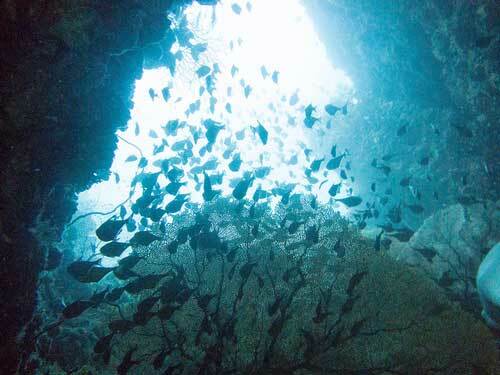 It is one of Koh Chang’s most popular diving sites and the maximum depth is 15 metres. 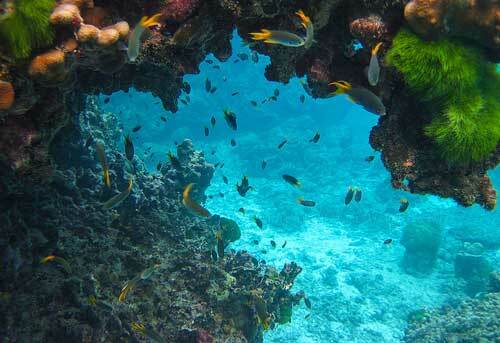 One of the best diving sites in Koh Chang, Hin Luk Bat is located only 3 km southwest of Koh Chang. At this pinnacle, you can see shoaling fish, moray eels, rays, parrotfish, angelfish, banner fish, barracuda and even dolphins. Maximum diving depth is 25 metres. Koh Rang is a beautiful, multilevel diving site. For dives of up to 30 metres, visit Hin Ga Daeng, where you will primarily see fish like trigger fish, turtles, batfish, groupers and barracuda. There is not much coral here. For more shallow dives, maxing out at 16 metres, visit Hin Kuak Ma, where you can see stone fish, eels, angelfish, stingrays, coral, bamboo shark or turtles. 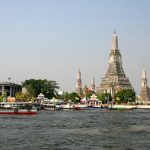 Those looking to dive into Thailand’s depths should do so through a dive agency like Dive The World, who is partnered with PADI: the Professional Association of Diving Instructors, and DAN (Divers Alert Network). It isn't a good idea to dive with random companies unless you know they have the official PADI & DAN certification in place, which ultimately equates to keeping you safe. Be aware that before you dive, you’ll generally have to complete a certification course that will prepare you for any challenges you might face underwater. Additionally, PADI certification has different levels of skill, allowing some divers to complete more advanced dives; dives of greater depths, longer dive times or locations with more intense currents. As with any activity, diving includes risks: malfunctioning equipment, pulmonary embolism (lung pressure and popping from rapid ascents), oxygen toxicity (from diving too deep), nitrogen narcosis (over absorption of nitrogen from a deep dive) and the (admittedly small) risk of attack from marine life. So if you have any pre-existing health conditions, be sure to mention them to your dive instructor before certification begins. Don't worry too much though. Take your experience in stride. If you dive with a reputable company and follow all instructor directions, you'll be sure to have an underwater experience in Thailand that’s out of this world. Hi, this comment is about travel health insurance for both single and multiple trips as well as expat long-term health insurance. I was not sure where to put this so move it as you see fit. I did extensive research on a number of plans and,by far, GeoBlue was the most affordable, easisest and clearest policy language with direct pay and an extensive base of doctors and hospitals. Online and app administration was terrific as was emergency contact and help. In addition, buried deep in many of the other plans is a little exclusion that, basically says, "...if an accident or condition is as a result of in full or in part, the use of alcohol or illegal drugs, then the plan will not pay." Now I am not an illegal drug use but, well, I've been known to have a drink or so, especially on vacation...so...Geo Blue was the only policy that did not have that exclusion and, basically, made everything easy, understandable and effective. Would this insurance count as health insurance with the retirement visa or does it have to be the local companies?Thanks for a great site! Great article about diving in Thailand.